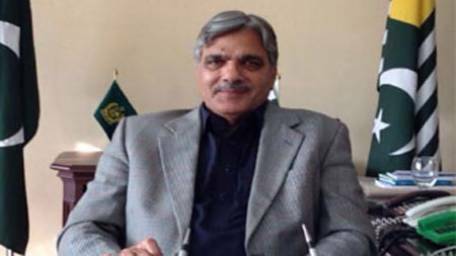 ISLAMABAD, Sept 21 (APP): Minister for Kashmir Affairs and Gilgit Baltistan Chaudhry Barjees Tahir Wednesday said it would have been better, if Imran Khan had held march against Indian aggression and human rights violations rather than creating unrest in Pakistan. have rejected politics of Imran Khan by casting votes against him in recent by-elections. adding today on one hand Pakistan was facing war hysteria of India and on the other Imran Khan was busy in creating chaos. Imran’s march towards residence of Prime Minister Nawaz Sharif showed his immature thinking and this act of PTI chief was beyond comprehension, he added. against Nawaz Sharif, Imran had ignored all the sensitive national issues. He said Imran Khan inflicted irreparable damage on the country with his protests and sit ins against the government on important and sensitive occasions. He asked what kind of patriotism and support Imran Khan wanted to show for the country when he held sit ins and protest march on the occasion of visit of President of China in 2014.
political parties should have a unanimous stand and they should send a unified message to the world by putting aside their personal politics. creating chaos in the country, Imran Khan should call off his sit in and march and effectively raise his voice against Indian aggression and cruelties in Occupied Kashmir. diplomatic efforts for exposing Indian barbarity and send message of Pakistan to all corners of the world.